-- Compiled from multiple sources. 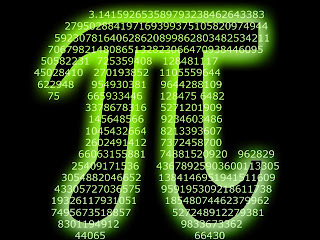 Pi (π) is an infinite, non-repeating (sic) decimal - meaning that every possible number combination exists somewhere in pi. Converted into ASCII text, somewhere in that infinite string if digits is the name of every person you will ever love, the date, time and manner of your death, and the answers to all the great questions of the universe. It is not true that an infinite, non-repeating decimal must contain ‘every possible number combination’. The decimal 0.011000111100000111111 is an easy counterexample. However, if the decimal expansion of π contains every possible finite string of digits, which seems quite likely, then the rest of the statement is indeed correct. Of course, in that case it also contains numerical equivalents of every book that will never be written, among other things. Let me summarize the things that have been said which are true and add one more thing. π is not known to have this property, but it is expected to be true. This property does not follow from the fact that the decimal expansion of π is infinite and does not repeat. The one more thing is the following. The assertion that the answer to every question you could possibly want to ask is contained somewhere in the digits of π may be true, but it's useless. Here is a string which may make this point clearer: just string together every possible sentence in English, first by length and then by alphabetical order. The resulting string contains the answer to every question you could possibly want to ask, but most of what it contains is garbage, you have no way of knowing what is and isn't garbage a priori, and the only way to refer to a part of the string that isn't garbage is to describe its position in the string, and the bits required to do this themselves constitute a (terrible) encoding of the string. So finding this location is exactly as hard as finding the string itself (that is, finding the answer to whatever question you wanted to ask). In other words, a string which contains everything contains nothing. Useful communication is useful because of what it does not contain.